You're the one who always does the right thing. Wise beyond your years, you always know what's best. Some might even call you an angel. Well, if the goodie-two-shoes fit, it's about time you wear them. Isn't it only right that they come with wings? A pair like Georgina Goodman's Hilda Pumps will suit you perfectly. The winged detail at the back and pearly hue are nothing less than celestial, and the peep toe and slender 4 1/4 inch heel make them darling and demure. Always the one who sets an example, show your friends something new at happy hour when you order a Sage Lady. 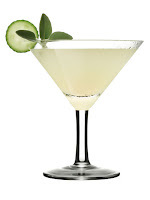 One of Marie Claire Magazine's Chic Summer Cocktails, it blends Absolut Mango, Cointreau, simple syrup, fresh sage leaves, cucumber slices, fresh lime and a dash of Peach Bitters. It's sweet, yet refreshing and light (kinda like you), so it's perfect for a balmy night. Don't let the crisp taste fool you, though, this is still an alcoholic beverage. Drinking too many will definitely lead to actions that may tarnish that stellar reputation of yours.